The housing here pre-dates many of the surrounding estates. The area is probably best known for Babbs Mill Local Nature Reserve and the CTC Kingshurst Academy. Council bosses have confirmed they will close all but four of the borough's dedicated children's centres as part of a £600,000 cost-cutting exercise in Solihull. BBC series that portrayed Mancunians as 'fat, drunk and destitute', People Like Us, turns its gaze onto Chelmsley Wood. Kingshurst is to host a wrestling match between star of ITV's World of Sport Wrestling show, Blondie Barratt and Midlands favourite Mad Dog Maxx. A petition to stop the council stripping part of a Solihull beauty spot of its Local Nature Reserve (LNR) status has attracted 800 signatures. Stephanie Bottrill, 52, said she felt "anxious and stressed" about having to move house because of the controversial benefit changes before the tragedy. Former students defended the Uniformed Services course leader - with many calling him the 'best teacher they ever had'. Solihull Council could close all of its 14 dedicated children's centres by next year following a £600,000 cut in its budget. Plans to put Kingshurst Medical Practice on the market have sparked fears that its 8,000 patients could be left without a GP. 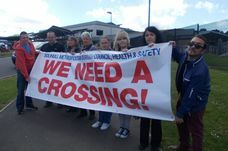 Woodland Green residents protest against plans to build a new housing development in Smith’s Wood.